One of the best things about e-books is one of the worst things about e-books — they make it so easy to find books that have long been out of print or hard to find. Bad news for used booksellers and bookstores. Bad news for me, who loves to browse through shelves of raggedy paperbacks and warped hardbacks. Good news for those readers who do not necessarily like that used book smell, and good news for books whose reputations have suffered for the fact that they’ve only sporadically been in print since their initial publication — books like Jetta Carelton’s nearly-forgotten masterpieces, The Moonflower Vine. The Moonflower Vine has experienced a renaissance in the past few years, all of a sudden the darling of critics and authors alike, but when I read about the book on The Neglected Books Page, it had been out of print for years. 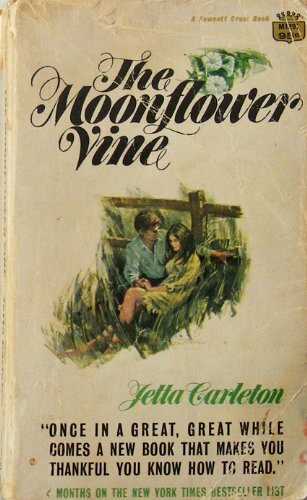 Despite being a Literary Guild selection and chosen for inclusion in that most American of institutions, the Reader’s Digest Condensed Books series, The Moonflower Vine and author Jetta Carleton were all but forgotten within several years of the book’s 1962 publication. It took me months to track down a copy of the book on Amazon, and when I did, it looked almost as pitiful as the copy in the picture above. It was well worth the wait and the fear that the book would fall apart in my hands; The Moonflower Vine is one of my favorite books, and one that deserves the bigger audience it’s likely to find now that it’s back in print, a critical success (for a second time) and available in e-book. On a farm in western Missouri during the first half of the twentieth century, Matthew and Callie Soames create a life for themselves and raise four headstrong daughters. Jessica will break their hearts. Leonie will fall in love with the wrong man. Mary Jo will escape to New York. And wild child Mathy’s fate will be the family’s greatest tragedy. Over the decades they will love, deceive, comfort, forgive—and, ultimately, they will come to cherish all the more fiercely the bonds of love that hold the family together. This is a pitiful synopsis, really, making the book sound like Edna Ferber meets Danielle Steele. Carelton’s prose style is timeless, descriptive yet uncluttered, and the book is more about how our perceptions of our family breed and create family secrets than the secrets themselves. The sun trickled down through the oak leaves. Away off in the woods a cardinal told us what a handsome bird he was. “Pretty-bird, pretty-bird!” he said over and over. Jessica sat on a blue towel, hugging her knees… She looked like Boucher’s Diana or a bather by Renoir. But she would have laughed if I’d told her, and said Boo-shay didn’t know boo-cat, or something to that effect. Jessica was not about to pretend she was anything but what showed up in clothes–a plain, middle-aged woman, rather dowdy and in need of a girdle. I looked at my other sister, sitting in the sunlight, brown and glossy as a warm brown egg. She was the one with enviable pigment, a dark-skinned blonde whom sunlight loved… No woman who looked like that, I thought, deserved the nature of Carry Nation. But Leonie’s was something like that. More than the rest of us, Leonie bore the vestigial burning passed down from our forebears, a hellfire breed that preached a trail through Indiana and Kentucky… She had this burning, this ax of God. But hers was a hard way, like theirs, and her defeats were many. It’s not gilding the lily to say that The Moonflower Vine deserves as special a place in American literature as similar books by John Steinbeck, Thomas Wolfe, Sinclair Lewis or William Faulker (I’d be willing to make the argument that The Moonflower Vine is better than almost anything by Faulkner). The unfortunate timing of the book’s publication, when family dramas were falling out of fashion in the literary world, plus the fact that Carleton wrote only one more book, the less-inspired Claire de Lune, made the The Moonflower Vine the stepchild of mid-century American literature. Go on, now, and buy a copy of The Moonflower Vine in whatever form you prefer. Mostly I love Carla Kelly this week. Also, I love my Royksopp, Air and Band of Bees stations on Pandora. Perfect background music for writing and reading by the way, interesting enough to keep you engaged, but unobtrusive. Go make your own now. Someone at Yahoo had the brilliant idea of gathering a bunch of writings by classic rock journalists together in one place and calling it Rock’s Backpages. All the usual suspects are there, like Barney Hoskyns, Al Aronowitz and Chris Salewicz and here’s an awesome piece on George Clinton that will make you wants to get funked up. I lurk around The Bookshelf Muse all the time. If you write for fun or profit, it’s well worth a few wasted minutes of time. This particular post about how to write males expressing emotion versus females was fascinating for me. The war between genre fiction and literary fiction continues to wage, but no one said it better than Daniel Abraham, who, in the guise of genre literature, wrote this lovely letter to mainstream. As in stream of Diet Dr. Pepper coming out your nose. Sometimes, I just like to see cats in tiny hats. What — you don’t? Now I’m going back to reading genre fiction while listening to Royksopp and stopping periodically to think about hats for cats. There are a bunch of movie nerds in the world. Some of them have converged at Sound on Sight. They’re writing a lot of great stuff about great, overlooked movies. Books are changing, publishing is changing, and it’s all enough to make your head hurt. Lawrence Block addresses all the above on his Goodreads blog. I loved Barbara Samuel’s 1990s-era contemporary romance novels written under her pseudonym Ruth Wind. She writes a wonderful blog about writing called A Writer Afoot. Did you know that the New York Public Library has a fabulous online image gallery? They also have a great online shop. At the Pop History Dig, there’s huge archive of essays and articles from years past about years past. For Mad Men fans, the section about advertising is especially fascinating. I’m a crazy cat lady. I’m also a music nerd. The love child of my fetishes is The Kitten Covers. I’m just pissed that someone else thought of it first (and has the talent to pull it off). In the dark days before I fell in love with my new boyfriend Dana Andrews (damnit, why are all the good ones married/ancient/dead?!?! ), I used to watch a lot of PBS. If you love American Experience, get on over to the American Experience site, where you can watch almost every AE episode ever, plus — big, big, big plus — see tons more supplemental information about nearly all of the episodes. It’s like that rabbit hole I told you about, only Internet. Since we’re in the mood for movies, don’t let’s watch bad ones. Before you watch, go to DVD Verdict and read my pal Amanda DeWees’ reviews. Not just because I like her, either. Some of the reviews are better than the movies, seriously.Like this one. Oh, and Amanda talks a bit about her reviewing days at her own site. Think you and your juvenile delinquent friends invented graffiti, old-timer? Hardly. From Anne Glover’s swoon-worthy Regency Reads site, I learned about some really degenerate Romans and Englishmen who just couldn’t get enough of defacing public structures. Only they did it with a chisel. Kind of makes your stupid spray paint cans look amateur, doesn’t it, homey? At New Domesticity,Emily Matchar is making old domesticity as irrelevant as your graffiti. Not really. She’s just writing thought-provoking posts examining the current trend towards homemaking amongst post-feminist generation. And don’t even start with your “post-feminist” crap — those are Matchar’s words, not mine. That’s all for now. I’ve got more drooling to do. I promise come next week I won’t be so lazy. I’ll actually write something, I vow. In my defense, I did spend most of the week on planes. No excuse, I know. Lapham’s Quarterly touts itself as a “magazine of history and ideas.” It’s actually a rabbit hole that will steal your soul for several hours at least. Good news is, you’ll actually be smarter when you dig yourself out than you were when you went in. Win! Do you spend hours on Facebook, looking at pictures of people you don’t even know/like, just because you’re nosy? Head on over to Look at Me, a tumblr full of old, weird photos that submitters find in the strangest places. It’s much better than looking at your best friend’s neighbor’s niece’s drunk graduation party pics, I promise. Once upon a time, in a publication called Boston After Dark, a woman named Ellen Herst published a bizarre, fascinating piece about parallels between the Manson Family and Mel Lyman’s commune or whatever it was. Both the Manson Family and the Mel Lyman Family are the dirt swept under the rug of sanitized history, so Herst’s story is even more compelling. Go ahead and read it here. Dare you. Nobody talks about nurse romance novels anymore. Hell, no one even knows about nurse romance novels anymore. Except Susannah, whose wonderful Vintage Nurse Romance Novels blog keeps the faith. Feeling fat, stupid, boring, sad about your fashion choices and otherwise yucky? Going to The Selvedge Yard will only exacerbate your problems, but you’ll see lots of beautiful people, gorgeous things, and good writing. Bob Sullivan, whose concerns are many and range from glass shower doors to Craigslist robberies, is worried about the gaping chasm between the Facebookers and the non-Facebookers. He’s as hysterical as usual, but still interesting and informative. Maybe you don’t want to learn anything. Maybe you just want to laugh until Diet Dr. Pepper foams out your nose and your belly hurts. In which case, go straight to David Thorne’s page and have at it. National Journal is full of thought provoking articles, like this one about Muncie, Indiana’s precipitous downfall, and this one about how the game Life reflects — or distorts — American life. Over at Bridgeman Education, you can waste a few hours scrolling through almost a half-million images of fine art, photographs, and photographs of art, so you can feel much more cultured and refined than you actually are. Stop by Letters of Note and see why you should be spending your time writing thoughtful, funny, crass or otherwise interesting letters to your loved ones and beloved enemies instead of wasting your time on the internet. Learn more about the Victorian era than you ever wanted to know by going to Victorian Web. Disclaimer: it’s called a web for a reason, mostly because it’s shooting off in a million different uptight and horror-stricken directions, but also because it’s sticky. Got a midcentury home? How about a ranch house with delusions of grandeur? Get thee to Retro Renovation, but don’t blame me if you’re suddenly depressed by your own humble 1960s-1970s era home. Are you planning your summer vacations, dear readers? If so, visit Defunct Amusement Parks first to make sure you’re not planning a National Lampoon’ family vacation. If you don’t tear up at the sight of the sad wrecks that used to be our national treasures, you’re just mean and I don’t like you anymore. That’s it. That’s all you’re getting. Now go waste time somewheres else, you sorry varmint.